I am not a party person. I personally don’t like clubs, loud music or rave parties. My idea of a party would be more subdued like those of the Victorian era. But when I was invited to witness Bigg’s Illumination – well, how can I say no? The title makes you think of some Third World religious stuff (trust me to associate Illumination with Illuminati) but it’s actually an innocent and rather daring event by a homegrown brand in Naga. Bigg’s Diner, now on its 32nd year has been known as a retro place – a resto where you go to eat and experience a 60s – 80s throwback. But recently they’ve been updating their game to still have that retro touch that made them famous while remaining relevant to their target market – the millenials. According to CEO Carlo Buenaflor, Biggs Illumination is their attempt at connecting to the younger generation. Biggs Illumination is a neon rave party. The dance floor is pitch black and only blacklights illuminate the scene. Wear white or neon colors and you stand out. Wear black and you’re hidden. Flourescent make up is available for anyone who wishes to add a hint of neon color to their garb. DJs from Metro Manila were invited to share their beat and get the young Naga populace grooving to a beat. Of course, cocktails and beer were available in makeshift bars around the dance floor which was in a roof deck of a commercial building in Naga’s gimmick district. 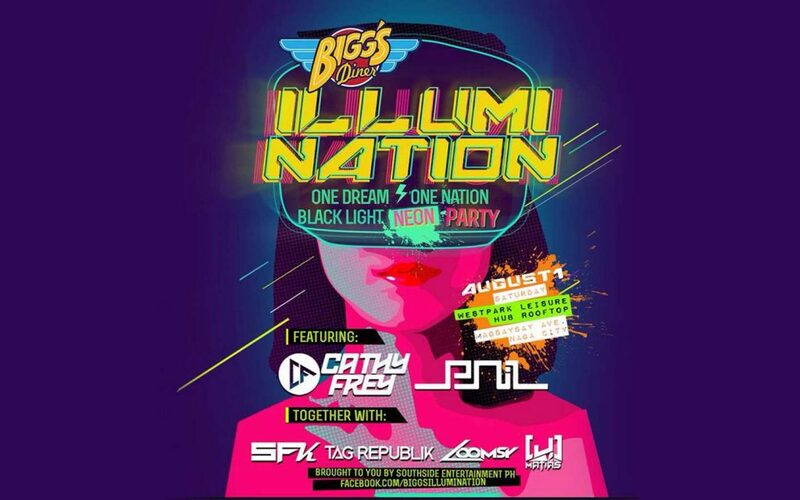 I laud Bigg’s attempt to stage a first-of-its-kind event in Naga. Bigg’s has always been a game changer pioneering events the city has yet seen. Looking around the venue, it felt as if I haven’t left Manila at all. However, a look at the crowd validated that I’m still at a provincial city. In Manila, it’s normal for people to start hitting the dance floor the moment they set their foot in. Those milling about have beer cups in their hands and before long will be out in the dance floor. In Naga, the crowd is more reserved. There was an atmosphere of feeling each other out. The crowd did not immediately take to the dance floor and it was a long time before anyone started to dance. Gates opened at 6pm and I arrived at 9pm to a mellow crowd. I was expecting the party to be in full swing by then. Even when I temporarily left at around 10pm, the crowd had only started to thicken but nobody was really dancing yet. It was around midnight, after the Tower Burger Challenge that the real party began. It seems they were still waiting for the program to start not knowing that in raves like these, it’s a spontaneous event. Dance til you drop is the theme. But despite the slow start, it’s still a great event for Naga. As a friend said, expose Naga to events like these and soon enough they will get the hang of it. And from the looks of it, Bigg’s is definitely the brand to do just that.